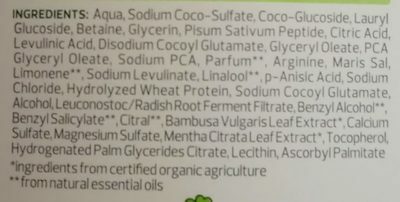 Aqua, Sodium Coco-Sulfate, Coco-Glucoside, Lauryl Glucoside, Betaine, Glycerin, Pisum Sativum Peptide, Citric Acid, Levullinic Acid, Disodium Cocoyl Glutamate, Glyceryl Oleate, PCA Glyceryl Oleate, Sodium PCA, Parfum, Arginine, Maris Sal, Limonene, Sodium Levulinate, Linalool, p-Anisic Acid, Sodium Chloride, Hydrolyzed Wheat Protein, Sodium Cocoyl Glutamate, Alcohol, Leuconostoc / Radish Root Ferment Filtrate, Benzyl Alcohol, Benzyl Salicylate, Citral, Bambusa Vulgaris Leaf Extract, Calcium Sulfate, Magnesium Sulfate, Mantha Citrate, Licithin, Ascorbyl Palmitate. Product added on November 20, 2017 at 6:17:36 PM CET by anticultist. Last edit of product page on November 25, 2018 at 3:39:28 PM CET by openfoodfacts-contributors.